The mantra given by me in this post is a Shabar Mantra to cure the disease of Cholera. 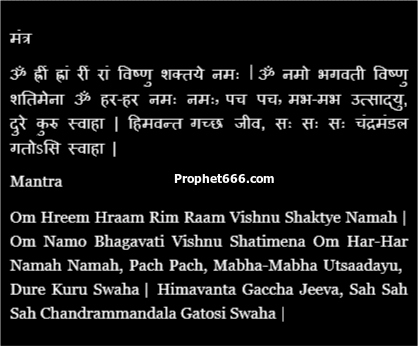 The mantra which invokes Bhagwan Vishnu has to be mastered on any auspicious Hindu festival or any other auspicious Muhutra or during the period of any Solar or Lunar Eclipse by chanting it 108 times. The practitioner should before commencing the Siddhi Sadhana, have a bath, wear clean clothes and keep a Katori[ small steel utensil] filled with Ganga Jal[ holy water from the river Ganga] in front of him and then commence the Siddhi Sadhana. To practice the mantra on a Cholera affected person, the practitioner has to take the Katori in his left hand and sprinkle the water in the Katori on the body of the affected person with his right hand. This has to be done 108 times in all each time he sprinkles the water, he should chant the mantra.